After a successful crowdfunding campaign Blacktop Mojo return with Burn The Ships, a 13 track album that is packed with what is becoming their signature sound and a bit of more traditional rock as guitar solos become more prominent and the overall tone is ranging to the southern rock vibe. In previous talks with the band and various message through that crowdfunding page, Blacktop Mojo has become a full time dedicated effort to make music as not only means of earning a living, but to sharpening their musical skills. So what does Burn The Ships offer to us as listeners? Is it worth a play or two? While I can’t answer those questions for you here is my take on the music thus far and what you can maybe look for as well. Songs like End of Days bring that heavy tone and atmosphere as Blacktop brings their heaviest riffs and fast pacing to the top as this song shines like a beacon of arena rock potential. Being one of the popular singles already from the album, Where The Wind Blows is straight to the roots southern in nature and a proving to be a sound all it’s own as the instruments and vocals create this new sense of Southern driven rock. Definitely a stand out song to consider. Shadows On The Wall is a very somber track as minimal guitar work brings up the intro and verses leaving plenty of room for vocalist Matt James to work his skills and really show a dynamic side to his vocals as he sustains the lyrics wonderfully. His approach to the chorus is notable as well as the pre-verse shows him dialing down his voice so the heavy distortion of the guitars can change your mindset. Overall one of my favorites thus far. Dream On is more than likely a song everyone has heard at least once in their life. Either through film or YouTube or other means. Recorded in 1972 and released in 73, Dream On became a major hit and rock staple for Aerosmith who to this day enjoy a successful music career. Blacktop’s Interpretation of Dream On however is it’s own beast as they bring a modern rock and southern flair that is overall a more heavy and dense sound. From the spot on vocals to the very passionate drums and guitars, this cover has all the major workings of a band you WANT to learn more about. With many other covers on the Blacktop Mojo YouTube channel, Dream On stands out because of it’s rock legacy and only gives Blacktop Mojo more of a reason to be a band rising to the top. Also Matt hits the high note in a almost poetic fashion as the height of emotion of the song finally takes over. 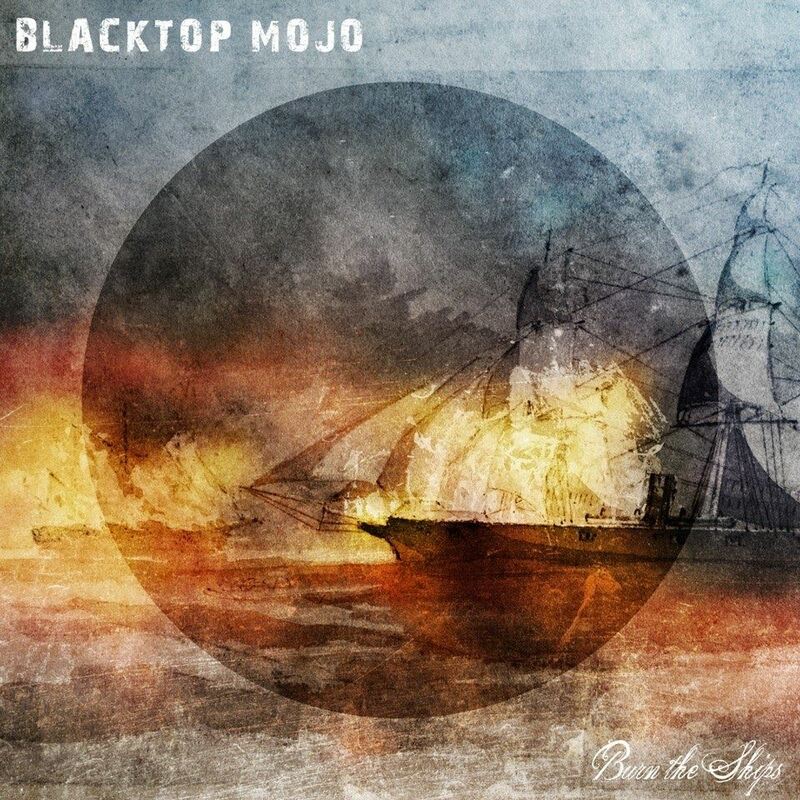 Burn The Ships by Blacktop Mojo isn’t a strange encounter from the previous nor is it a venture into the wild of trying new things. With the softer songs like Underoath and Prodigal, Burn The Ships offers a bit of ballady rock songs as well as toe tapping southern hard rock goodness. Notable fact: Blacktop Mojo has allowed for their latest album to be stream in it’s entirety on their YouTube channel. Final Thought: Blacktop Mojo‘s passion and professionalism on Burn The Ships is proof of once you put your time and energy into something, a truly stand out effort can be made known to the world. As the music market demands more from an artist every release, Blacktop Mojo have proved themselves ready for the challenge. So all in all this is a very enjoyable album that offers a lot to one or many listeners from the heartfelt lyrics to the different pacings and styles of the song that create a vibrant chapter of music for a band that is quickly on the rise to rock stardom. Blacktop Mojo, Burn The Ships, Contrast CTRL, Feature, Hard Rock, Matt James, Music, Reviews, Southern. Bookmark.